Instead of writing out one long winded story about the annual trip to Acadia National Park and the adventures associated with that trip, I’m writing out a few shorter stories. These don’t cover every detail of the trip, but it should give a good feel for my time hanging out on the island. Also, I didn’t have a camera with me, so instead of pictures, I’ve put interesting little maps in to give scale to these adventures. 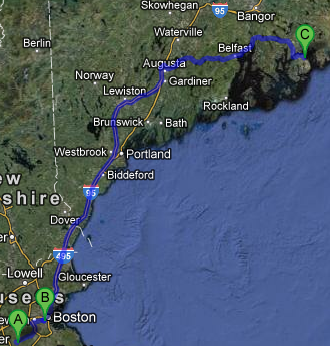 It’s a long drive from Boston to Acadia. Every time I drive up there, I understand this fact in the back of my mind… but that never really prepares me for the reality of the drive. Five and a half hours, by map, stretches out into six and seven hours when you have to stop for gas, for food, and simply to stretch your legs out so that your feet don’t fall off. And that’s just the time spent driving, not the time spent organizing everyone in the car, packing your gear into the trunk, unpacking it when you arrive, and then setting up camp on the island. By the time we finally arrived on the island it was dark, raining, and all three of us (Daniel, Stef, and myself) were so sick of the car that we didn’t have any trouble jumping out of the car and into the rain. Thankfully, Daniel and I are old-hands at the whole “driving to Acadia” shindig, and we had an ace up our sleeve to revive us after the long drive – Captain Nemo’s BBQ shack. That’s right, an old-school BBQ shack in the middle of an island off the coast of Northern Maine. And not just any boring shack… this place took the idea to heart, and ran with it faster than a marathon runner – the ceilings were barely six feet tall, the “dining room” was filled with old furniture, and the beers came in three sizes: “small”, “medium”, and “large”. I put those in quotes for this simple reason – “Small” = 24oz “Medium” = 32oz and “large” = 48oz. Seriously. All for $4, $6, and $8. THAT was what brought me back from the edge, after the long ride of not being able to pick the right music. Combining a 36oz stein of home-brewed red ale with a massive plate of chili-cheese-nachos does a man a world of good, and by the time we left I was ready to brave the rain and get to rocking out at Acadia.